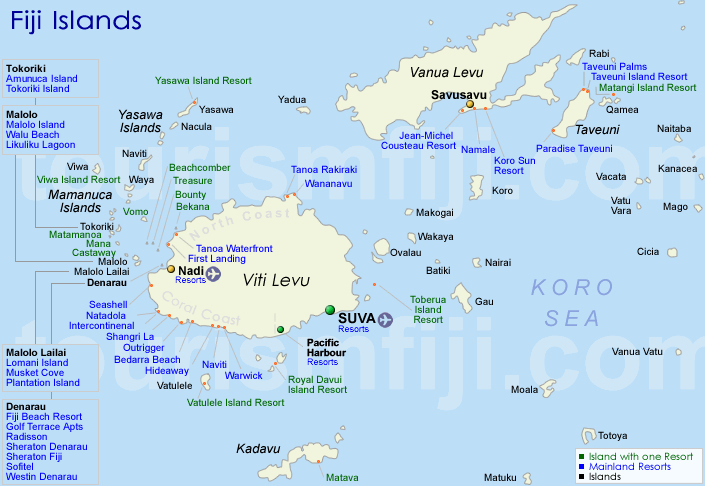 Fiji is an archipelago consisting of hundreds of islands and islets, most of which are uninhabited. It has a tropical marine climate and is warm all year. Because of these elements, it is an ideal vacation spot that many have escaped to for dining, diving and surfing adventures. Traditional Fijian cuisine features root crops, fresh vegetables, herbs and spices, meats and seafood. The tropical climate means that fruit is always in season. Nowadays, Fijian dining has seen an influence from abroad, especially from Indian cultures. This influence creates a modern twist on many traditional Fijian dishes. When dining in Fiji restaurants, look for dishes that feature fresh seafood. Kokoda is a traditional dish that nicely highlights the best the island has to offer: fresh fish and tropical fruit and herb flavors. Island cultures almost always offer scuba diving and snorkeling as an exciting outing. Because of the huge reef that surrounds the islands, Fiji is no exception to this. There is so much to see underwater that a dive in Fiji is an experience that you will never forget. Fiji is known for its soft corals, but these are only a fraction of the underwater treasures that the reef holds. Fiji’s waters will dazzle divers with hundreds of varieties of fish in addition to anemones, sponges, crustaceans and many other fascinating creatures of undersea life. Scuba diving in Fiji is an experience of a lifetime that offers endless sights that will amaze all divers, regardless of experience level. For some time, some of the best spots to surf in Fiji were the sole territory of certain resorts. In 2010, the Fijian government essentially deregulated these waves, opening up surfing to all visitors to Fiji regardless of where they are staying. Fiji’s tropical climate permits surfing all year, but the winter, from April to October, is the best time to surf. This is because low-pressure systems create swells in the surf, making conditions ideal for surfing. In the summer months, the winds aren’t as strong, and it tends to be hotter and glassier. While you can learn to surf in Fiji, the conditions are more suited for experienced surfers. Fiji is a tropical paradise featuring beautiful beaches, warm ocean currents, appetizing local food and ideal conditions for diving and surfing. Anyone who enjoys relaxing by the shore or indulging in adventures in the water will love their time in this island chain. Tourists from around the world visit the beautiful islands of Fiji. Besides the warm hospitality, and equally warm weather, Fiji is famous for its water activities. With 300 islands surrounded by reefs, Fiji is a prime location for unsurpassed scuba diving and snorkeling. Surfing in Fiji along with boating activities are favorites for tourists and Fijians alike. Fiji is famous for its world-class diving. Many Fiji travel packages provide an assortment scuba dives in Fiji. Some Dive charters specialize in shark dives, swimming with manta rays or wreck dives. The Yasawa Island group is the most popular place to view manta rays, and is legendary for its stunning white, sand beaches. For an unforgettable scuba dive in Fiji, Taveuni Island, on the eastern side of Fiji, is unsurpassed in its abundant wildlife and spectacular coral displays. Snorkeling is popular on most islands along the shallow reef fringes. Most Fiji travel packages include abundant snorkeling and swimming opportunities. Surfing in Fiji is becoming a popular activity especially in the Mamanuca Island Group. The Yasawas are also popular for body surfing. For serious surfing, a trip to Tavarua and Namotu Islands for the world renowned Cloud Break and Swimming Pools beaches is an absolute requirement. The Fiji government has now opened all of its beaches to public surfing through the Surfing Decree of 2010. This makes surfing possible anywhere in Fiji without having to book a trip through a specific private operator for beach access. Billfish fishing and reef fishing are popular activities in Fiji. Most resorts offer professional fishing charter services for visitors. Charter captains and local fishermen have unique knowledge and success from fishing in their home waters. Billfish tournaments attract fishermen from around the world. Nothing is more romantic than sailing between Fiji’s islands on a clear day. Sailing charters are popular because Fiji has some of the best cruising grounds in the South Pacific. Sailors can day-sail from anchorage to anchorage to experience rural culture and magnificent beaches without the tourist crowds. Sailing is a popular way to visit outer islands that are not available to most tourists such as the Lau Island Group. For visitors wanting a real Fijian boating experience, they should take a trip up one of the rivers and return by bilibili. Bilibilis are traditional bamboo rafts that Fijians have used for thousands of years to fish and travel along the rivers and estuaries. Paddle boarding, kayaking and wind surfing are also popular water activities. Most beach resorts and hotels offer their guests access to these activities. Whether you are an active water sports enthusiast, or you need some quiet time gazing at the beautiful beaches from under a coconut palm, Fiji offers an incredible assortment of activities for visitors to enjoy.